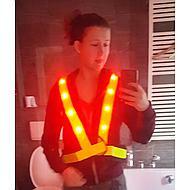 Reflective sleeve with LED lighting, so you can be clearly visible in the dark. Provides good light in the dark. 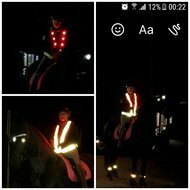 Really a must-have item if you go out in the dark! Great jacket, fits everyone. The LED lighting is clear and good bright, can be in three positions. Very visible, bright light in various positions. Spacious adjustable so always fits.